Original aircraft. Accepted by USAAF 14 May 43. Cheyenne Mod Center 21 May 43. Gore Field 19 May 43. Cheyenne 21 May 43. Geiger Field 28 May 43. Great Falls 7 Jun 43. Gore Field 12 Jun 43. Dow Field 10 Jul 43. 8th AF 13 Jul 43. 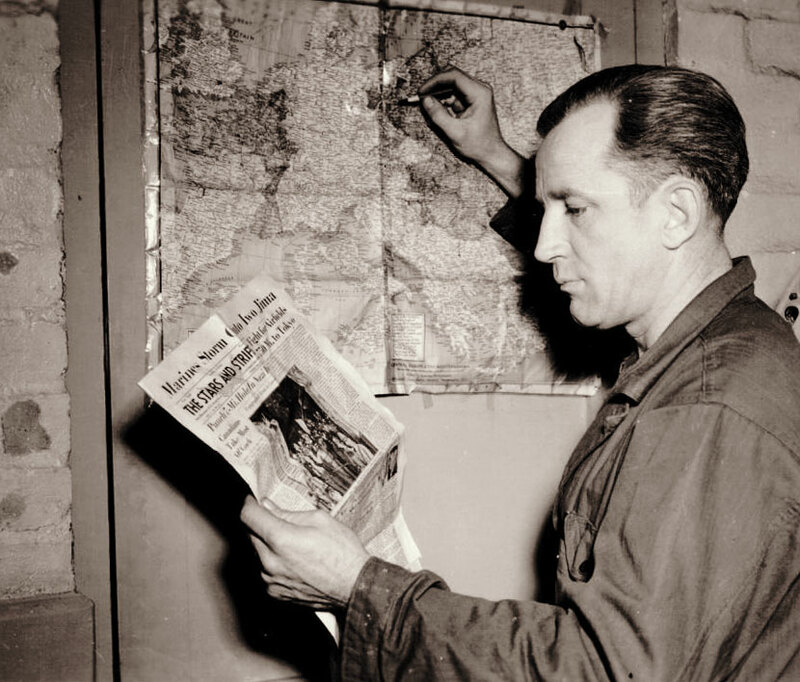 John F. Tierney WIA 7 May 44 at Berlin. To U.S 4 Jul 45. To Altus 14 Aug 45. Accepted by USAAF 31 Aug 43. Cheyenne Mod Center 4 Sep 43. Grand Isle 7 Oct 43. 8th AF 6 Oct 43. Transferred to RAF 21 Jan 44. Accepted by USAAF 28 Sep 43. Denver Mod Center 10 Sep 43. Grand Isle 31 Oct 43. 8th AF 14 Nov 43. Crash landed on 23 May 44. Salvaged by 1st Strategic Air Depot. Accepted by USAAF 29 Sep 43. Grand Isle 16 Oct 43. 8th AF 14 Nov 43. MIA Brunswick 10 Feb 44. Shot down by fighters, crashed at Bloksijl. Harnish KIA, Burke, Lambert, Tarleton evade, rest POW. Accepted by USAAF 26 Nov 43. Cheyenne Mod Center 26 Nov 43. Palm Springs 27 Nov 43. Kearney 6 Dec 43. Des Moines 17 Dec 43. Syracuse 18 Dec 43. Presque Isle 20 Dec 43. 8th AF 30 Dec 43. Edward J. Colangelo, waist gunner on crew 88, KIA 16 Aug 44. Laverne J. Dillow, tail gunner on crew 88, KIA 25 Sep 44. To U.S. 3 Jul 45. To Kingman 18 Dec 45. Accepted by USAAF 28 Sep 43. Long Beach Mod Center 29 Sep 43. Grand Island 17 Oct 43. 8th AF 1 Nov 43. Louis Matthews WIA 27 Apr 44 at Le Culot. Maurice Heaton, Howard Thomas WIA 7 May 44 at Berlin. MIA Boulogne 5 Jun 44. Hit by flak, caught fire and crashed in English Channel. Eigh bail out prior to crash. All KIA.